A special session was ?conducted on Footwear Retail for PGDM-RM( 2013-15) on 19th December'14. The session was conducted by Mr. Aloke Mukherjee. Mr. Mukherjee is an Ex- DGM, Bata-India and Academician with over 42 years of total experience. He has been associated with brands like Woodland, Duckback to name a few in his industry experience of 35 years. 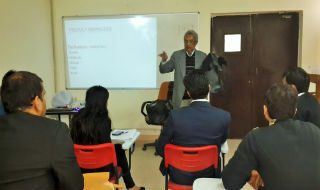 He conducted practical session on the structure and parts of shoe, leather types and its identification, types of footwear for both men and women, display techniques used in footwear retail and opportunities and challenges in Indian Footwear Retail Industry. 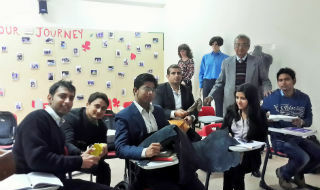 Students gained insight on the footwear and leather market especially in context to Indian Retail scenario. The session was organised by the Retail Department of JIMS.